There are a number of ways to determine how much weight you need for scuba diving. As we all know, the proper weighting makes for more pleasurable and controlled dives. However, determining the appropriate weighting can be a bit challenging if not managed correctly. Determining the correct weighting depends upon a number of factors, such as the thickness of your wetsuit as well as your body type. In addition, the buoyancy contribution of all of your gear must be factored in as well. When properly weighted you should be able to float freely in the water column at eye level. 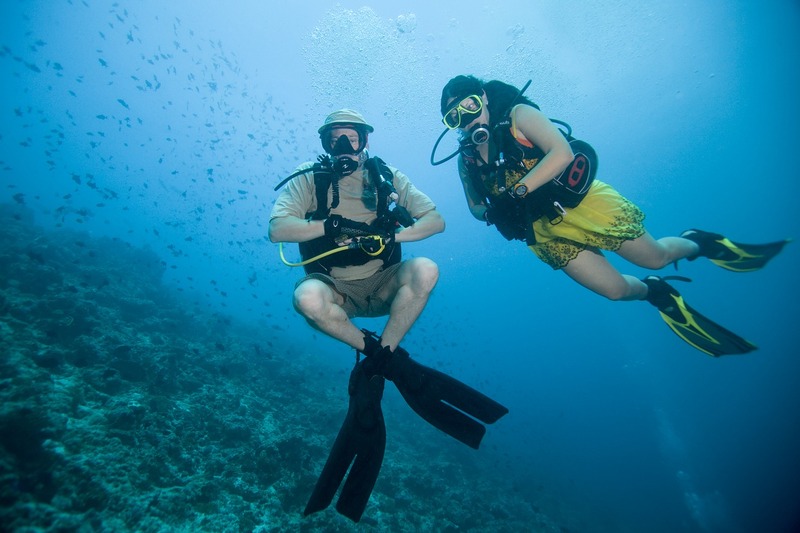 Once your proper weighting is calculated many suggest adding an additional 5 pounds as compensation for the added buoyancy of the breathing gas that will be consumed during your dive. Methods used to calculate your weighting include the ball park method of just carrying 10 percent of your body weight in lead and the surface float method where you load enough weight to float with the water at eye level in full scuba gear. You can also determine the appropriate weighting by calculating the buoyancy for each contributing factor and summing up their individual weighting requirements as described in the SportDiver.com post referred to below. You would calculate the weighting for each of the following contributing factors. After summing up all of the weighting requirements for each component you can check your accuracy by gearing up and verifying your buoyancy in full gear. You can also easily compensate for the buoyancy differences between salt and fresh water as described here. By how much do you have to change your weight belt when going from fresh to salt water? To be accurate, you have to consider the whole package: diver plus equipment. Stand on the bathroom scale with the equipment and weight that makes you neutral in one medium or the other. Or you can estimate. A standard aluminum 80 tank weighs 32 pounds, a 7mm wetsuit is about 8 pounds. For regulator, mask, fins, etc., figure about 15 pounds. Include your weights. Going from fresh water to salt? Multiply by 0.025 and add that amount. Going from salt water to fresh water? Multiply the total by 0.025 and subtract that amount from your weight belt or integrated-weight BC. Example: You weigh 175 pounds and your equipment adjusted for salt water weighs 75 pounds, for a total of 250 pounds. 250 x 0.025 = 6.25. Subtract 6 pounds from your weight belt for fresh water. The following video demonstrates how to determine the proper weighting while in full gear ….